Electrical engineer John Chidgey joins us in this episode of The Engineering Commons to talk about ladder logic, podcasting, and an engineer’s role in making the world a better place. An open invitation to discuss general engineering issues got Jeff started in the world of podcasting. Carmen, Brian, and Adam became trapped involved as co-hosts on this podcast when Chris Gammell left the show. Our guest for this episode is electrical engineer John Chidgey, who has worked in several engineering domains, including RF hardware, systems engineering, and the oil & gas industry. He also produces a weekly podcast, Pragmatic, and authors the Tech Distortion website. Carmen and John are fans of making coffee with the Aeropress. Citizens band (CB) radio served to interest John in electrical engineering. John notes that there is a general trend toward standardization, as the costs of customization are too high for many companies. For a while, at least, John had a job that may (or may not have) required a security clearance. Our guest moved into the controls industry around 2003, installing programmable logic controllers (PLCs) for industrial clients. Many PLCs can be programmed using ladder logic, which originally was nothing more than a schematic for wiring together electromechanical relays. John has had some bad experiences programming PLCs with software implementing function block diagrams. After testing out several other podcast concepts, John launched the Pragmatic podcast to cover engineering topics in a practical and actionable manner. John mentions the Hypercritical blog, written by John Siracusa. Carmen is excited to read the recent OS X 10.10 Yosemite review that John Siracusa wrote for Ars Technica. In additional to covering technical topics, John’s podcast sometimes covers non-technical issues like weather forecasting and coffee. John reveals that he loves using whiteboards. A live chat room has recently been added as a feature of the Pragmatic podcast. Jeff doesn’t think he could handle the additional cognitive load while recording interviews. We’ve gone meta with a podcast about podcasting! John occasionally gets requests for career advice, although many times engineers write in to simply point out technical errors. According to our guest, engineers can change the world by providing reliable services and infrastructure that will improve people’s lives. John can be found on Twitter as @JohnChidgey and @PragmaticShow. His podcast is Pragmatic, and his website is Tech Distortion. 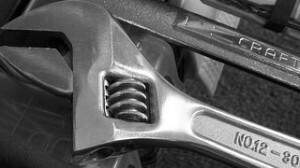 Thanks to Daniel Oines for the untitled photo of a crescent wrench. Podcast theme music by Paul Stevenson.